Results of the March Question of the Month: What do you practice? If the secret is in the dirt, I’m afraid our hands are a little too clean. Another month has come and gone here at One Bearded Golfer, and yet another round of poll question results are in. The March Question of the Month asked what do you practice to improve your golf game? The results are staggeringly politically correct. A full 78% percent of respondents dutifully submitted that they really work on improving the weak areas of their game, presumably trying diligently to raise the floor of their golf games rather than extend their ceilings by grooving what their good at. And none among you admitted that you really just spend most of your practice time banging away trying to improve your driver. I call shenanigans! If all of this were actually true, and that percentage of golfers actually worked on improving the weakest parts of their games, with any regularity, then there would be a lot more low single digit handicappers out on the links than I have observed in my golfing experience. Fortunately, there are a few honest souls among you, Dear Readers, who admitted that practice just isn’t their thing. God Bless their candor. The full poll results are below. Great poll. I would suggest that focused practice on a particular skill a couple times in a row will produce the best results in the end. Can’t take any credit for the poll question, Jim. One of Brian’s columns over at All About Golf gave me the idea, so I stole it, added a poll questionnaire, and got two posts-worth of material out of it. I’m finding that on about the 3rd range session after a lesson, whatever new thing I’m working on finally “clicks” pretty consistently. I just hope I can keep that sort of implementation rate up as the material and the learning curve get more sophisticated. I find the same thing. It takes about 3 or 4 focused practice times to figure out and semi-groove new things. If I stick to the basics, the more sophisticated stuff is easier. I enjoy hearing about your times on the range, just to let you know, we all experience the same things. I spend approximately 50 hours a week on a driving range and have to agree with your call of shenanigans. The number of golfers that gravitate to the driver is staggering but often times I can’t blame them. There isn’t much like the “feel” of a well struck driver that soars high and long. It’s the closest thing to a purely struck persimmon driver of the past. I’ve found it depends on the individual and why they are at the range. Many golfers are at the range strictly for recreation and the act of hitting balls (mainly with the driver) is exactly what they are doing. Those players that are working on lowering their handicap spend much more time on their short game and wedge play. It’s hard for me to remember that we really only hit about 12 drivers per round. 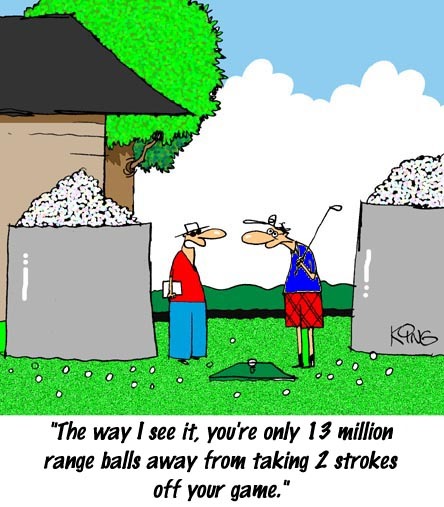 Compare that to the number of times we have to pull a wedge and hit that a variety of distances. Thanks, Matt. I appreciate you checking out the Blog, and I’m always interested in readers’ feedback.